I tend to come up with any excuse to eat dessert for breakfast. 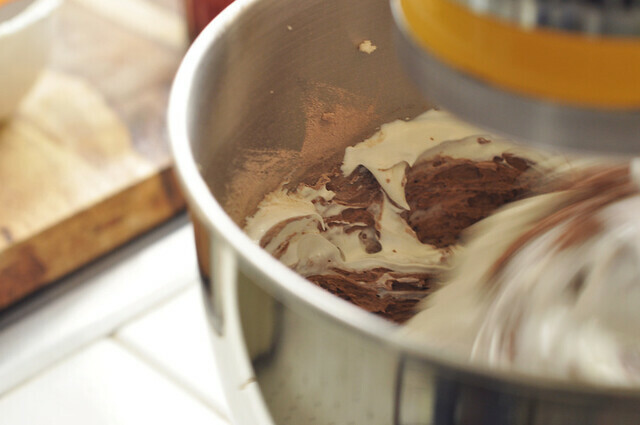 What can be more appealing than frosting and sprinkles and whipped cream and chocolate as soon as you wake up? Forget about the healthy egg whites with whole wheat toast, and fruit on the side or a giant bowl of oatmeal. Give me cake or pie or dare I say it, ice cream any time of day. Like a child who gets excited about the prospect of eating leftover birthday cake the next morning, I will do anything to bypass a “proper” morning meal in order to eat copious amounts of sugar at the start of my day. And in those moments when I reach for a slice of pie or cake, a voice comes into my head yelling at me to eat a substantial breakfast. A healthier breakfast. A more nutritional breakfast that will give me the energy to face my day. That voice in the back of my mind, spoiling the fun, is my mother’s. Much like any parent, she never allowed us to eat desserts in the morning, and I’m sure with good reason, although I fail it at the moment. There were times in my childhood when I was about eight, I would wake up early and sneak in some cake or ice cream before anyone else woke up. I would inevitably get caught, like a guilty culprit, walking out of the kitchen, as my mother was walking in. She would stop me and ask, “What did you eat? Did you have cake?” I would look at her innocently, not flinching, and say “Nothing. I didn’t eat cake. Wait, we have cake?” The frosting, icing, and chocolate smeared across my mouth and all over my face would give me away instantly. It wouldn’t even cross my mind to wipe away the evidence. What can I say, I wasn’t the sharpest knife in the drawer. I sometimes forget I am an adult now and can eat whatever I want. So on days when I do remember, you better believe I’m eating ridiculous amounts of sweets for breakfast without a care in the world. Why? Just because I can. I’ll find myself in the kitchen screaming out, to no one in particular, “I’m eating cake for breakfast. I’m shoveling ice cream into my mouth by the spoonful at eight in the morning!” No one stops me so I continue on my quest to break the rules. There are days, however, when the guilt creeps in. Days when I feel like I should make my doctor proud and eat something not so sweet. On those days I have “morning pastries.” Desserts disguised as breakfast like doughnuts, muffins, and coffee cake. I’ll reach for one of those instead to stop the guilt from forming. Happiness all around. 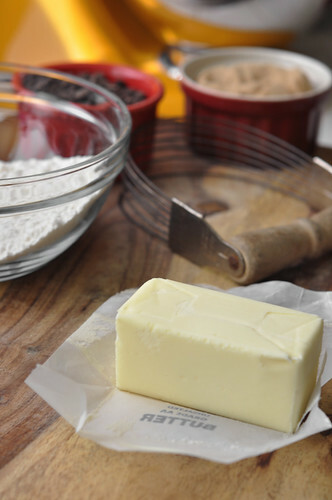 Much like any other great cake recipe, we need some butter for ours. People who don’t eat butter or avoid it like the plague should not be trusted. And since I eat butter like apples (kidding, I don’t really, only on days that end with a “y”) I can be trusted completely. 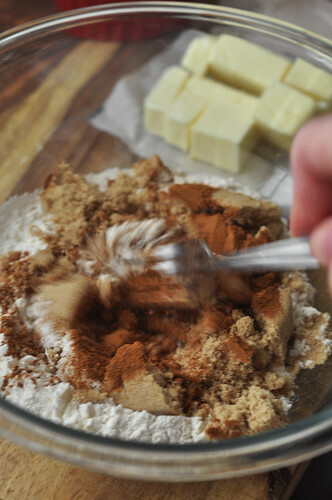 We are starting off by putting together the best part of coffee cake. 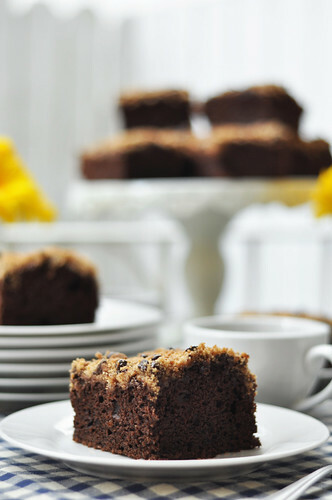 Do you know what the best part of coffee cake is? If you said the cake, you are wrong. That’s not the best part. 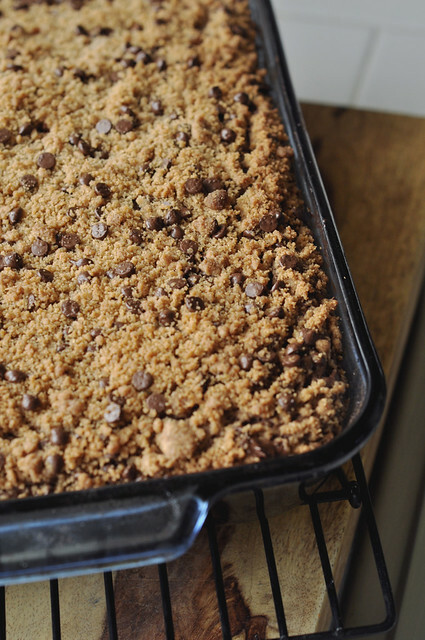 If you were thinking the crumb topping, then let’s you and I be friends forever. 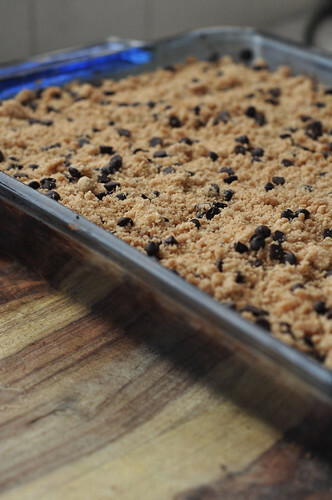 The crunchy crumbly streusel topping is absolutely the best part of any coffee cake. It’s really the only reason why I eat it. For the crumb, the butter should be slightly firm but not completely right-out-of-the fridge-cold. It should be slightly softened. 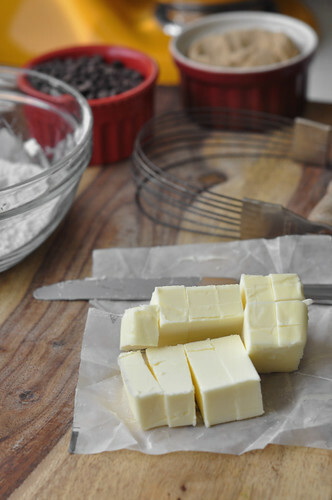 Cut the butter into chunks, to make it easier to incorporate into the other topping ingredients. 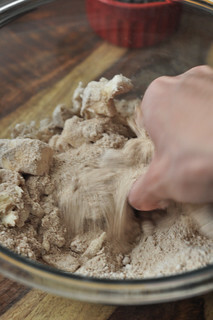 In a large bowl throw in the flour. 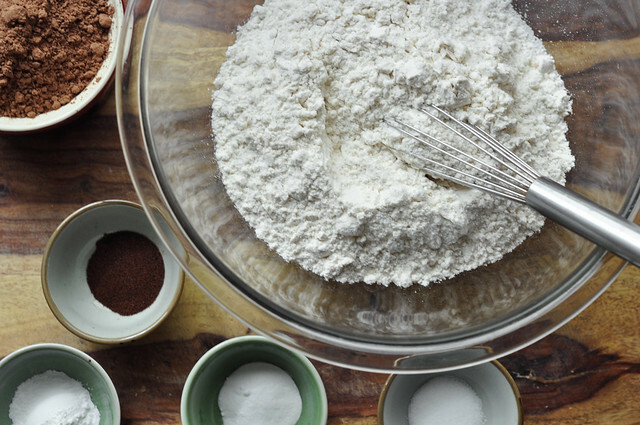 Give those dry ingredients a stir. 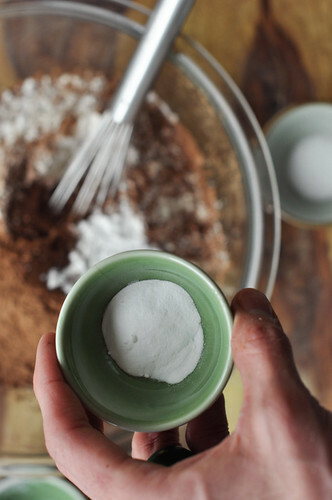 You can use a fork or a whisk or your hands to do this. 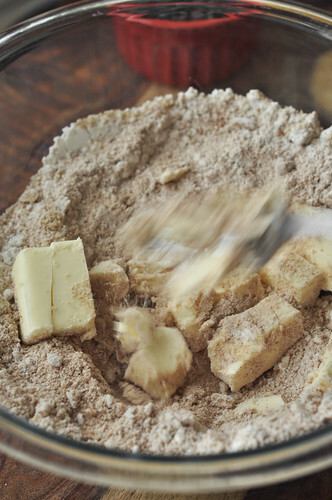 Add the diced butter and cut it into the dry ingredients. 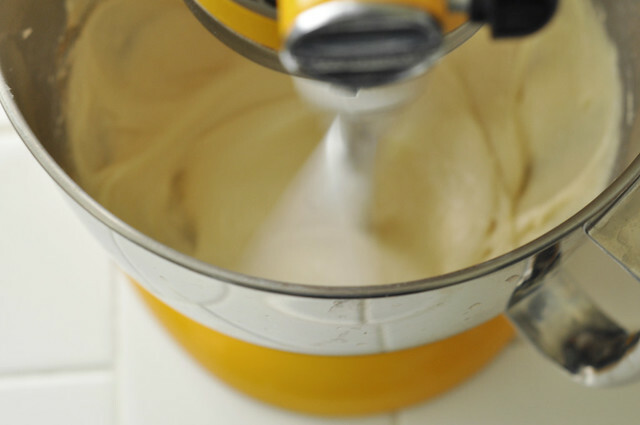 You can use the two knife technique, or a fork, or a pastry blender, if you are super fancy and own a pastry blender. At this point I quickly realized, as will you, that the fork just doesn’t cut it (pun intended). 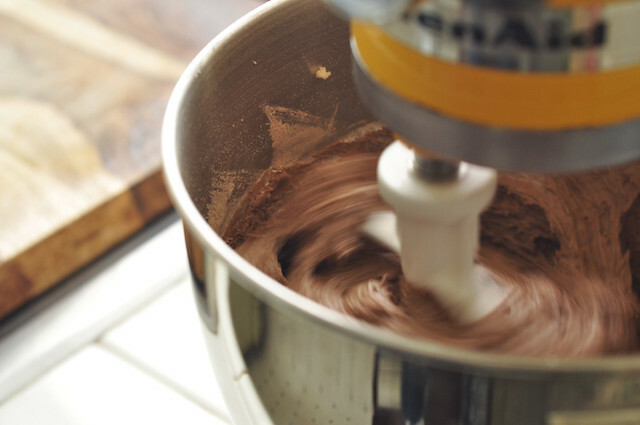 Of course if you have that pastry blender that will probably work out for you. BUT if you are like me and used a fork, it will start to become rather tedious and all you’ll want to do is throw the bowl across a wall. You’ll scream out in anger and yell at the fork for not doing it’s job. Oh maybe that was just me. I yelled at the fork for not doing it’s job, then threw it across the kitchen and just used my hands to breakdown the butter. It was easier. 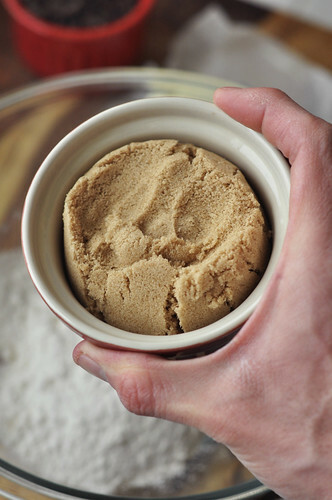 If you use your hands to do this, you want to work rather fast because the warmth from your paws will start to melt the butter and soften it too much. We don’t want that to happen. 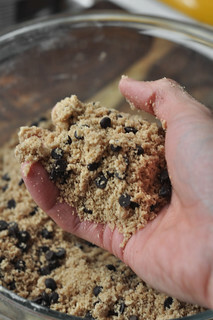 Squish and squeeze and mix until the mixture is crumbly and coarse. 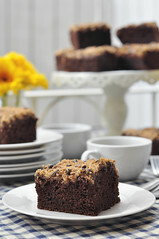 And because this isn’t an ordinary coffee cake, we are going to take it a step further by adding chocolate chips. 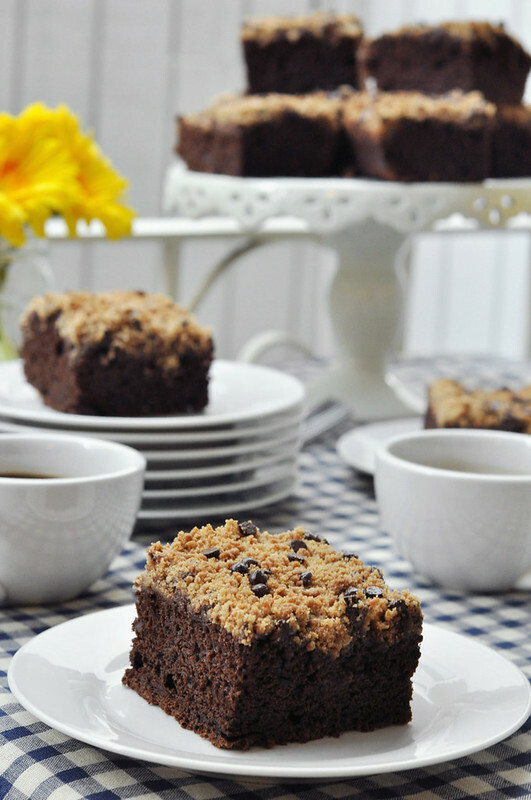 This is a chocolate coffee cake after all. 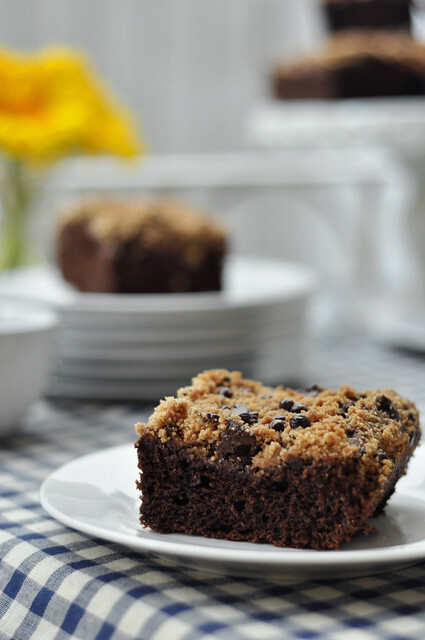 I decided to use mini chocolate chips because I felt that they were the perfect size for the crumb topping. 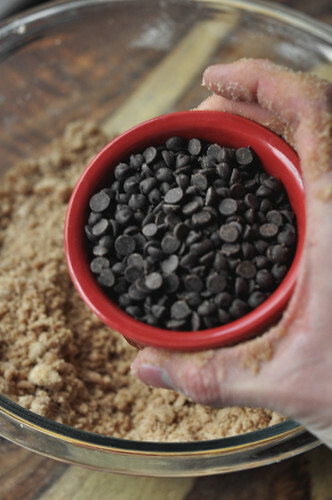 If you LOVE chocolate so much and want bigger chocolate chunks at the top, then by all means use the regular sized chocolate chips. Or go all the way and use the jumbo ones. No one’s stopping you. 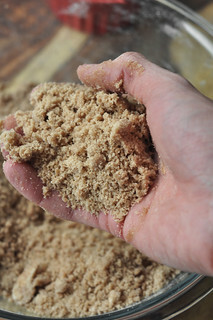 Add it to the crumb topping and give it a mix. 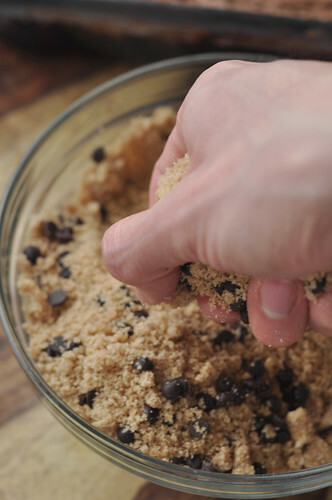 Once the chocolate is mixed in, set the crumb topping off to the side. Forget about it. Don’t even look at it. I know how difficult that might prove to be, or at least for me it was difficult because all I really wanted to do is grab a spoon and eat it all like cereal. Okay, now let’s make the actual cake shall we? 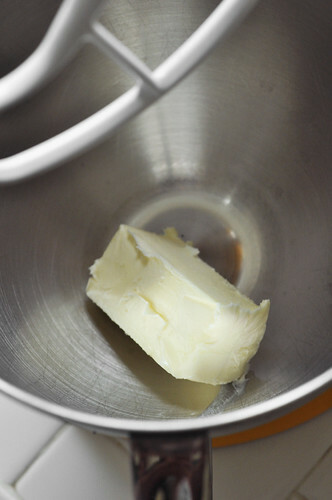 In the bowl of an electric mixer add butter. More butter? Yes more butter. 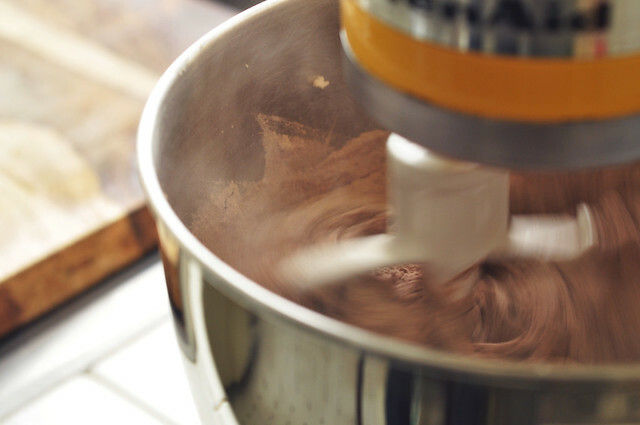 Turn it on and whip it up. 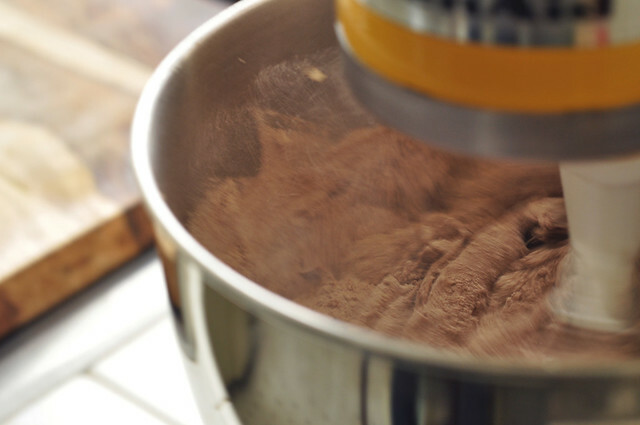 Reduce the speed to low and slowly stream in the granulated sugar. 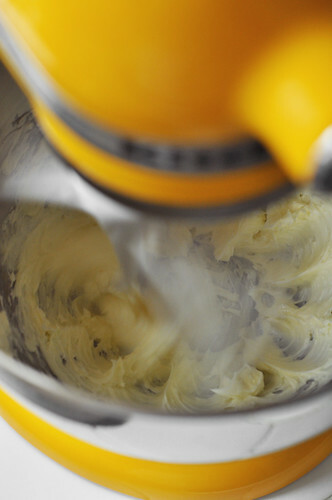 Raise the speed once more and whip on medium-high for about five minutes until the butter and sugar are creamed together, light and fluffy is the way to go. 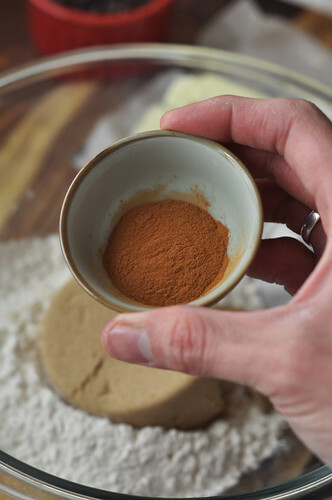 In the meantime, let’s turn our attention to the dry ingredients. 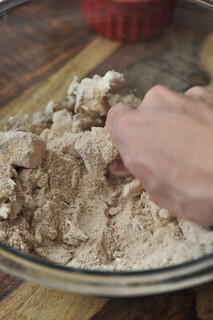 Like in almost every recipe we need to mix the dry ingredients together before we can add them to the rest of the batter. In a large bowl dump in the flour. 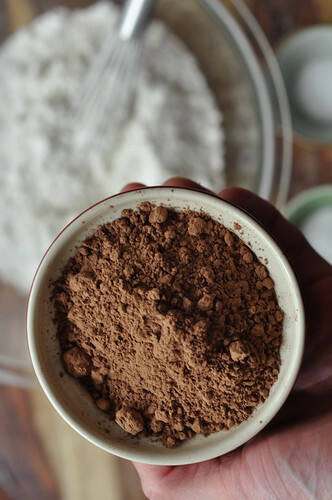 You can use cake flour if you have that on hand, it’ll make your cake a little softer and lighter in texture. Not lighter as in “healthier” because let’s be honest this is cake and cake shouldn’t be light. If you’re out there looking for a “light” cake, you shouldn’t be eating cake. I used all-purpose flour because that’s what I had on hand. I’m trying to make this cake as easy as possible for you. 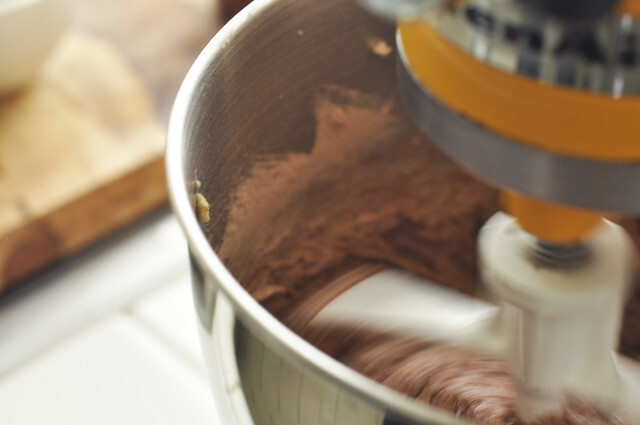 Baking is so tedious at times, but it really shouldn’t be like that always. Don’t worry too much about this cake being exactly the way it’s written. Feel free to swap out ingredients or add some if you’d like. Within reason of course. Don’t start just throwing in random things here and there that don’t make sense or omitting big portions of the recipe. 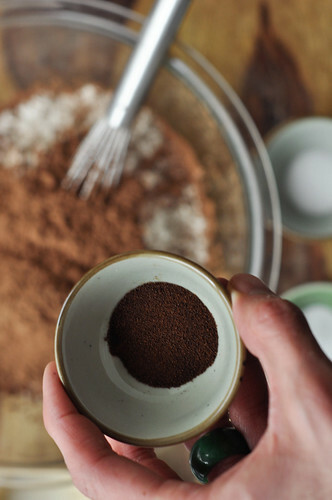 Espresso powder (just a little bit, you know me and my belief that coffee enhances the flavor of chocolate). 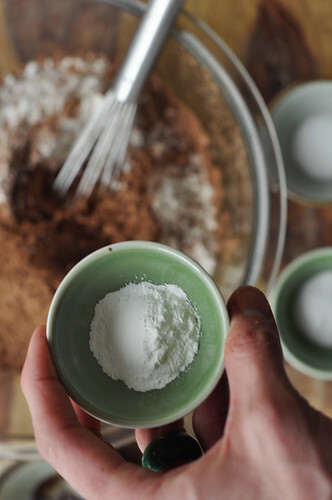 Give it all a mix or a whisk or a sift. Of course I just whisked it all together. 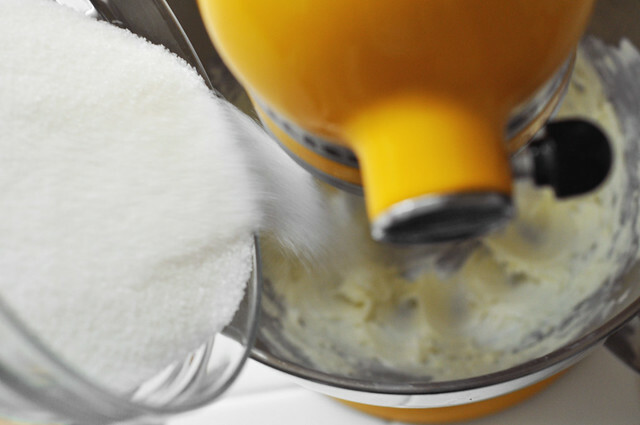 Now let’s turn our attention back to the creaming butter and sugar. 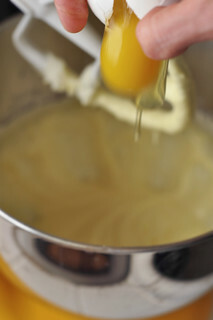 Add the eggs, one at a time, mixing well after each addition. 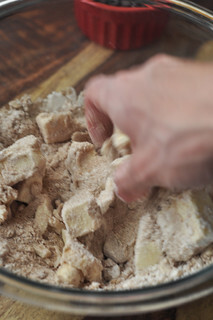 Stop the machine and scrape down the sides and bottom of the bowl, occasionally, to make sure everything gets well incorporated. Once the eggs are mixed in, it’s time to add the flavorings. Of course we need vanilla. 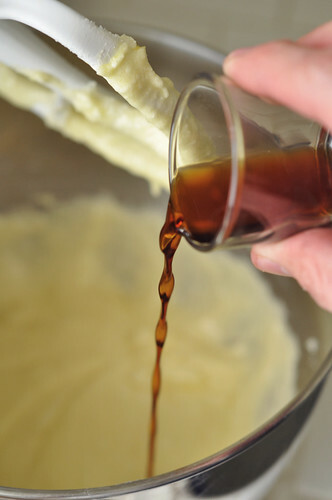 And we are also going to add a little bit of coffee liqueur. It’s just a tad, and it’s completely optional. You don’t have to add it if you do not want to. I do feel like it gives the cake a boost in flavor. If you happen to have some on hand for any particular reason, then add it. I always have some on hand because I’m constantly baking with it. That’s my story and I’m sticking to it. 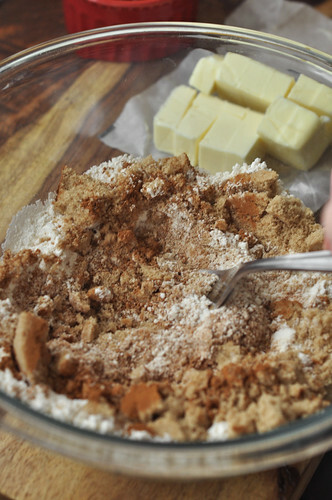 Mix it all together for a few minutes to fluff it up. Fluff it up. It’s a thing. You need to alternately add the dry ingredients and the sour cream. 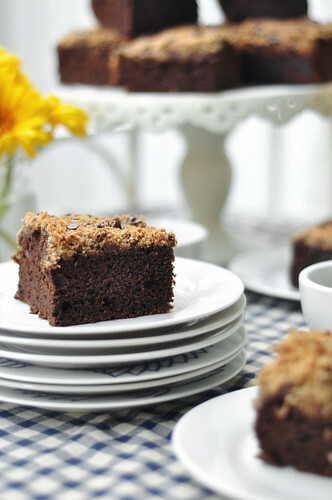 The sour cream will give this cake a great crumbly moist texture. 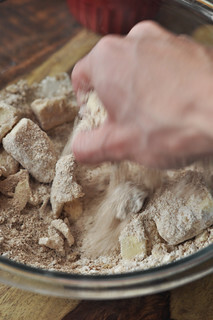 So add a bit of the dry ingredients and mix it. Then add a bit of the sour cream. 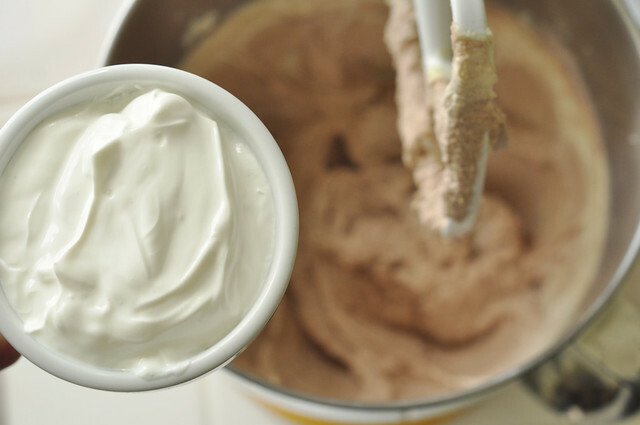 Continue this alternating process until both the dry ingredients and the sour cream are fully used up. 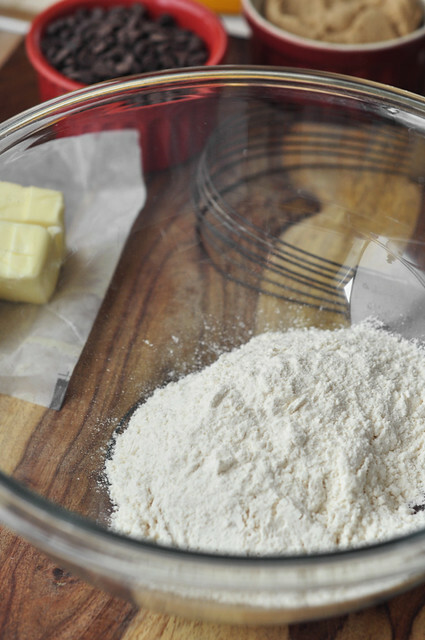 The only rule of thumb here is that you need to make sure you start and end with dry ingredients. I don’t know why this is the case but I’ve always been taught that that’s how it’s done. So let’s make sure we continue that tradition. Okay now both components of the recipe are done. 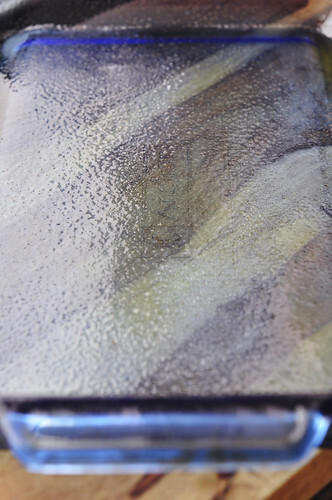 Prepare a 9×13 inch baking dish. You want to grease and flour it. That will prevent the cake from sticking to the baking dish. It’ll also prevent you from pulling out your hair and crying on the kitchen floor because your cake is stuck to the bottom of the pan and it won’t come out. 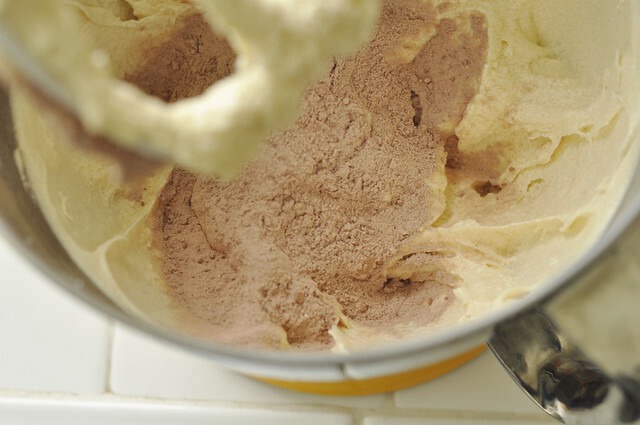 Spread out the cake batter and even it out with a spatula. 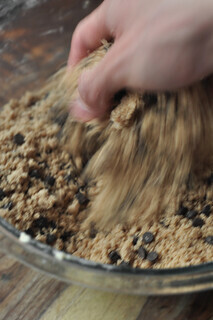 Okay now it’s time for the best part, sprinkle the entire top with the crumb streusel topping we made earlier. 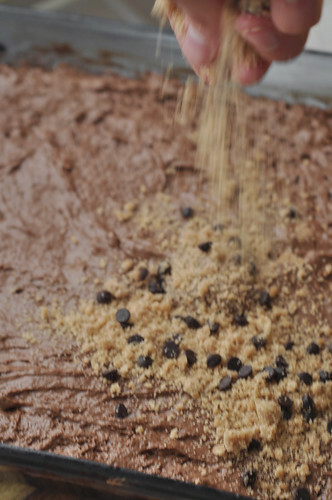 You don’t need to pat down the crumb topping, it will stick when it bakes. Just lightly, sprinkle it on top. 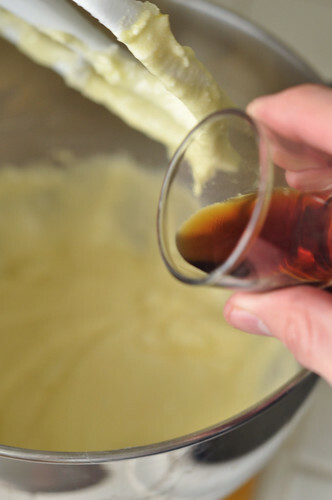 Bake the cake in a preheated 350° oven for about 40 to 50 minutes. It depends on your oven. I would check it after 40 minutes to see how it’s going, just to be on the safe side. Halfway through baking, rotate the pan to ensure even browning. You’ll know the cake is ready when a toothpick inserted in the middle comes out clean. After it has cooled for at least 20 minutes—I would probably do 30 minutes but that seems like an eternity when all you want to do is eat a giant piece of this cake—you can cut it and serve it and guess what, you can eat it too. You can cut it into smaller sizes to get more servings out of the cake, but since I’m greedy when it comes to cake I sliced it into 12 rather large pieces. 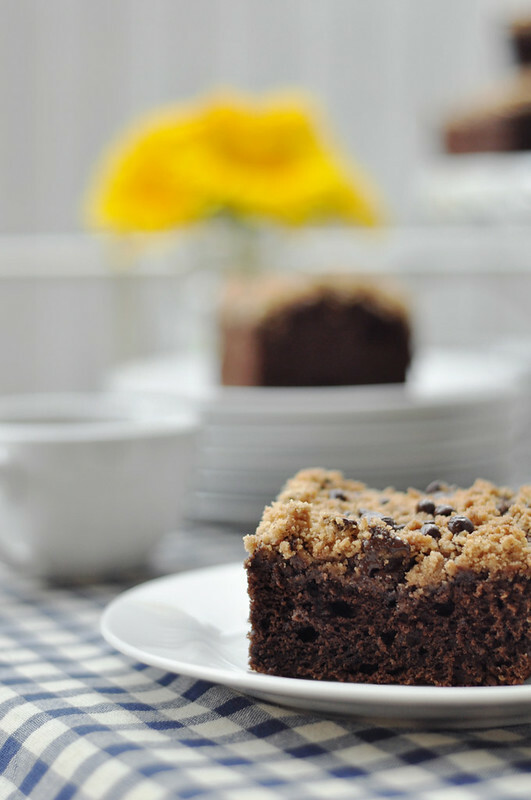 If you are used to eating cinnamon coffee cake and want to reinvent a classic, I would recommend trying this chocolate coffee cake for yourself. I don’t want to make any promises, but I can guarantee you that you’ll fall in love with this moist cake the minute you take the first bite. I did, but granted it doesn’t take much to make me happy. I’ll eat anything. This is the perfect brunch cake. 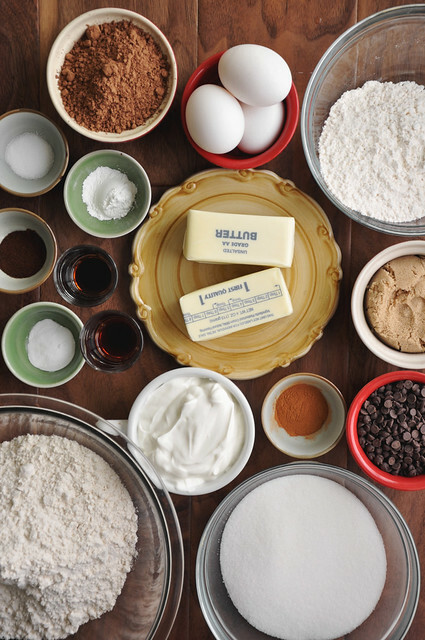 On the weekends I make a big morning feast for my family and I’ll sometimes make muffins, scones, or coffee cake to have something sweet to balance all of the savory action going on. It’s the perfect way to please a crowd, even a tiny one like mine. 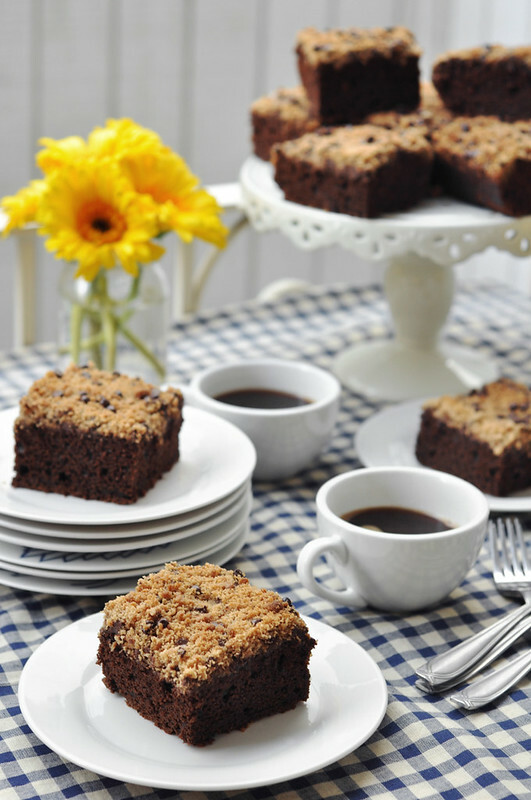 The idea of chocolate coffee cake, might sound weird to you, but it’s actually the best combination ever. 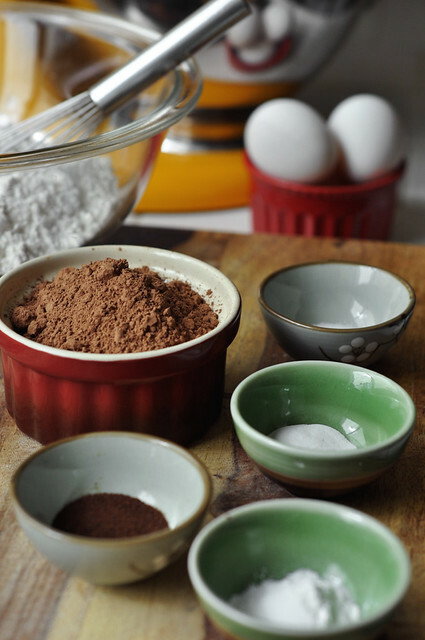 Cinnamon and chocolate belong together forever. I’ve run out of ways to convince you to make and eat this. 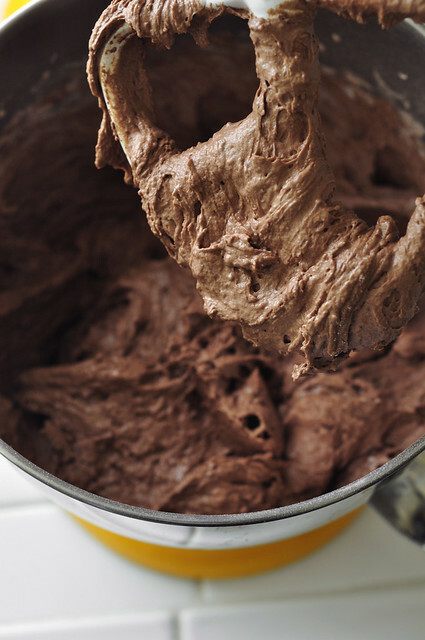 I’m now heavily relying on the images themselves to tempt you into chocolatey submission. I could say things like this cake is delicious and the best thing you’ll ever eat (again and again) but I think that close up images will do the work for me. 1. Preheat oven to 350°F. 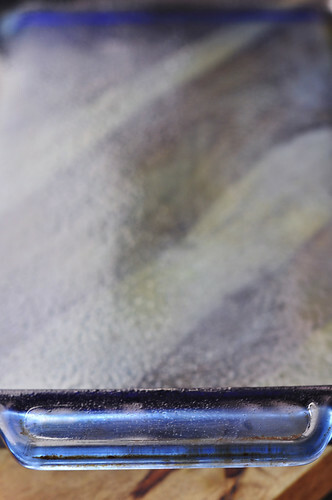 Grease and flour a 9×13 inch baking dish and set aside. 2. 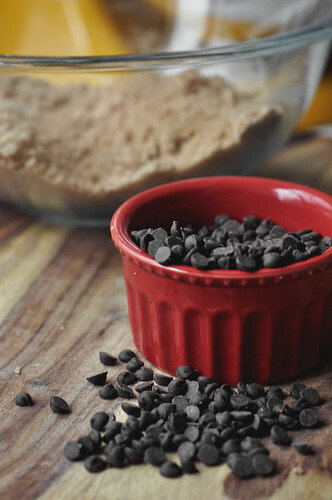 To make the topping: In a medium bowl combine all the ingredients except the butter and chocolate chips. 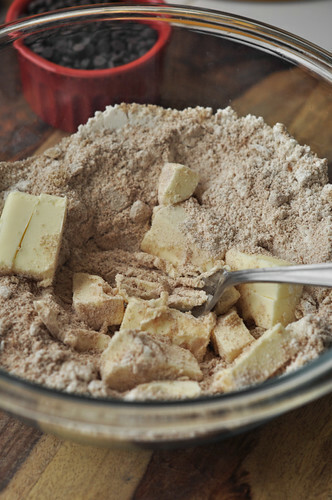 Once the dry ingredients have all been evenly mixed together add the diced butter. 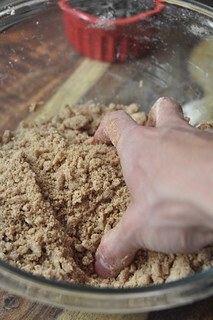 Using two knives, a fork, a pastry blender or your hands, cut in the butter until the mixture resembles coarse crumbs. 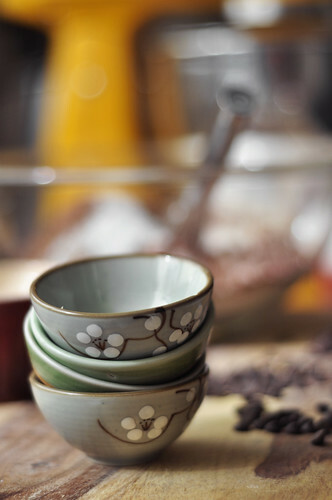 Stir in the chocolate chips and set aside. 3. 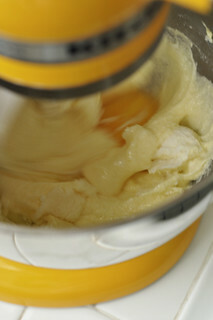 To make the batter: In the bowl of an electric mixer, fitted with the paddle attachment, whip the butter on medium-high for about 3 minutes. 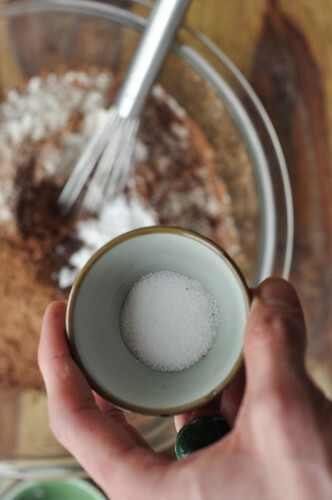 Lower the speed and slowly stream in the granulated sugar. 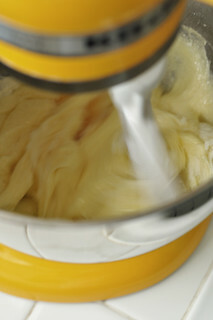 Raise the speed once more to medium-high and cream together until light and fluffy, about 5 minutes. 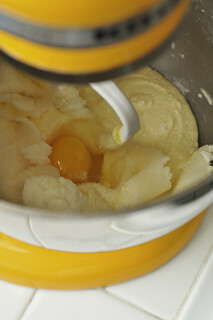 Add the eggs one at a time, mixing well after each addition. 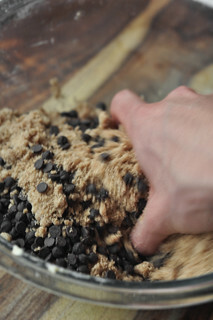 Occasionally stop the mixer and scrape down the sides and bottom of the bowl to make sure everything gets evenly mixed. 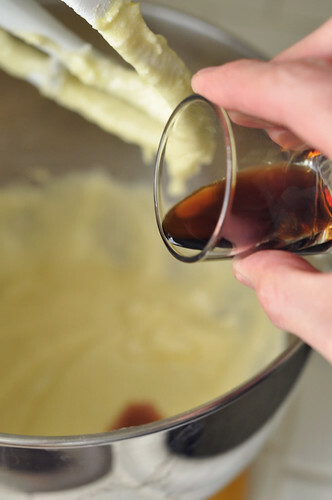 Stir in the vanilla extract and coffee liqueur if using. 4. 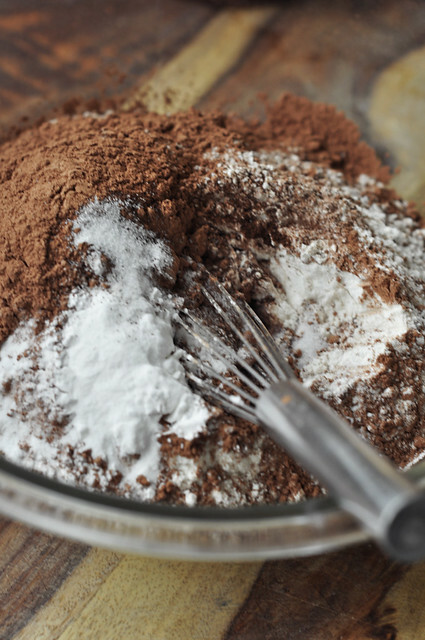 In a medium bowl whisk or sift together the flour, baking powder, baking soda, salt, and espresso powder. 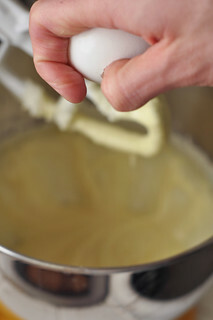 Add the dry ingredients alternately with the sour cream, beginning and ending with dry ingredients. So, dry, wet (sour cream), dry, wet (sour cream), dry, until both are used up. 5. 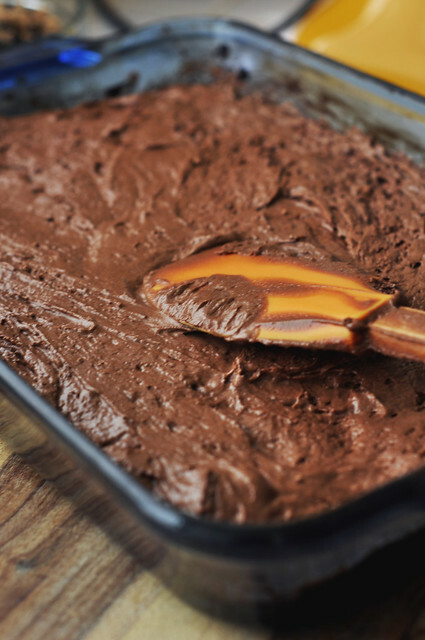 Spread the cake batter, evenly, into the prepared baking dish. 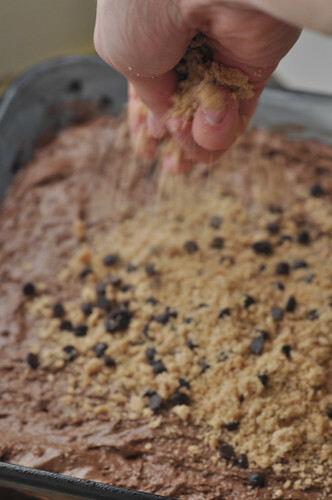 Top with the crumb topping from earlier, making sure to sprinkle it evenly over the entire top of the cake. 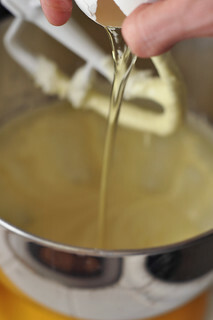 Bake for about 40 to 50 minutes or until a toothpick inserted in the middle comes out clean. Halfway through baking rotate the pan to ensure even browning. 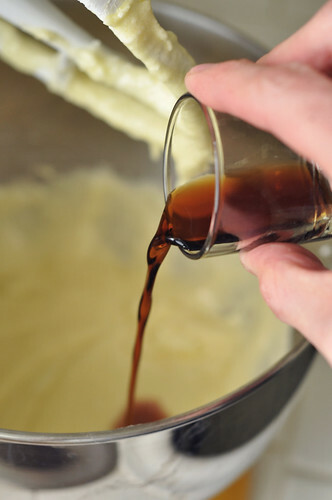 Depending on your oven, the cake might be done sooner, I would check it at the 40 minute mark and adjust accordingly. Remove from the oven and allow to cool on a rack for about half an hour. Cut and eat warm. Any leftovers can be wrapped tightly in plastic wrap or stored in an airtight container in the fridge for about 5 days. Warm in a preheated 300°F oven, wrapped in foil, for about 10 minutes or in the microwave for a few seconds. Enjoy! This cake looks so good! I love the topping! Thank you! 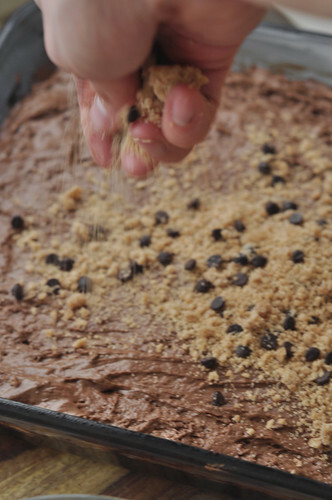 The topping makes the entire cake. Best part! Mmm this looks so fabulous! Love this cake! Thank you!! Hope you give it a try soon. 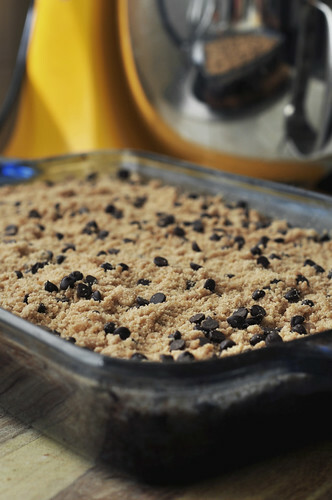 “If you were thinking the crumb topping, then let’s you and I be friends forever.” Yes! this looks incredible; can’t wait to try this! Thank you! Let me know what you think when you give it a try! Thank you! The way I see it, I only have one life to live so I’m not going to waste it by worrying about diets or fat-free or sugar-free. That isn’t living. 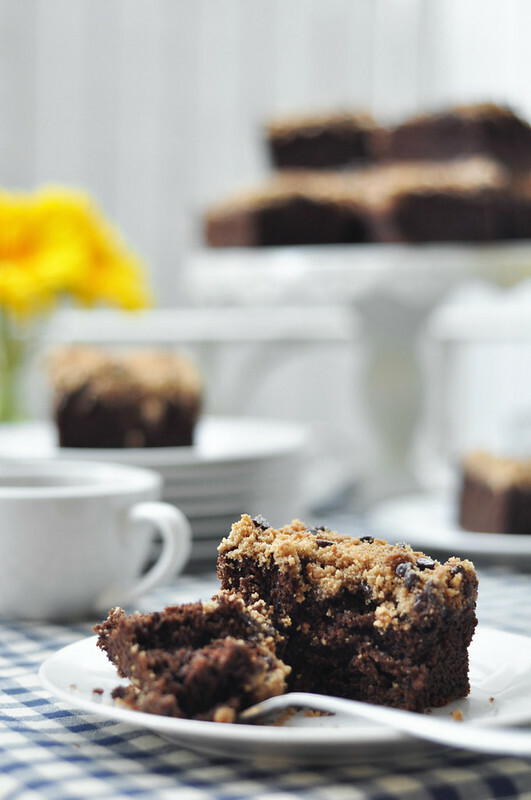 All things in moderation….and definitely cake for breakfast! I hope you try it soon. Let me know what you think. You’re killing me with all these recipes!! I think we’ll have to have this with our breakfast-suppers now. Breakfast for supper is the best thing on the planet! I make those for my family all the time. Enjoy! What is the function of sour cream?..if i dont have sour cream, is it will effect my cake? 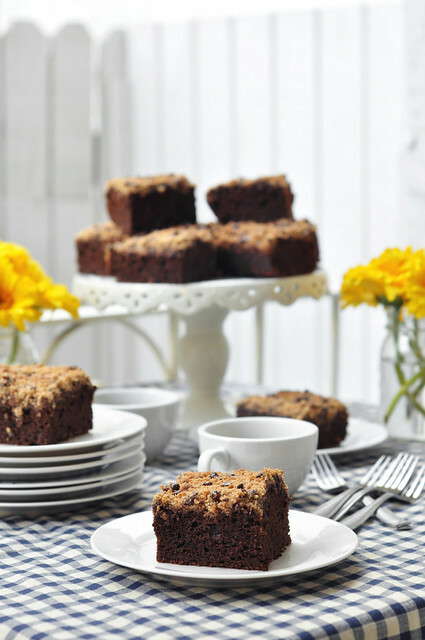 It gives the cake a moist and tender crumb. 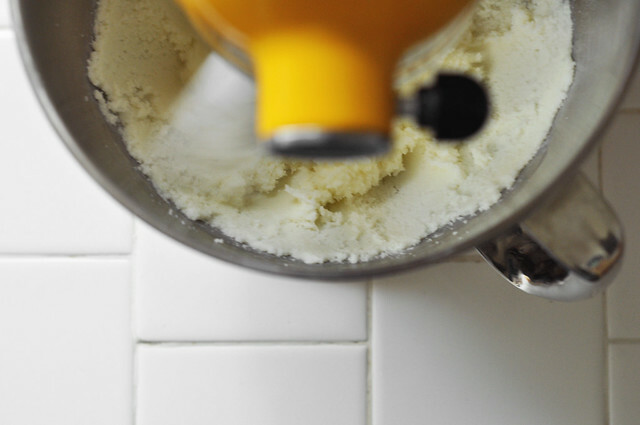 You don’t need to make it with sour cream. I’ve made it with buttermilk as well and it’s just as tasty! Oooooh this cake is sublime. I’m addicted. If you haven’t made it I urge you to drop everything and head to the kitchen. I’ll never feel bad to have cake for breakfast or for lunch, dinner or as a snack. Thank you very much! So glad you liked it!! Nothing wrong with having cake all day every day!